Supernatural 300 — “Lebanon” — Image Number: SN1413D_BTS_0372bc.jpg — Pictured (L-R): Behind the scenes with Jensen Ackles as Dean, Jared Padalecki as Sam, Samantha Smith as Mary Winchester and Jeffrey Dean Morgan as John Winchester — Photo: Dean Buscher/The CW — ÃÂ© 2019 The CW Network, LLC. All Rights Reserved. In “Lebanon,” SUPERNATURAL’s 300th episode, a relatively normal quest for Sam (Jared Padalecki) and Dean (Jensen Ackles) takes a drastic turn when the brothers get the shock of their lives: their long-dead father John (Jeffrey Dean Morgan) returns. The reunion in the milestone hour—which airs Thursday, February 7—is a big one for the show, as Morgan hasn’t physically appeared on-screen since the end of season 2. (All the way back in 2007.) And with the brothers struggling to find a way to save Dean, who has been grappling with Michael being trapped in his head, their father’s presence could be just what they need. Last summer, you teased the episode would focus on how the residents of Lebanon react to the brothers. Was John’s return always tied into that, or did that come later in the development process? I would say the hope for Jeffrey came early; the reality of Jeffrey came later. We did not know if he was going to be available to us until shortly before we started writing the script. Luckily, he was, with some help from Jensen. The idea of bringing Jeffrey back was there, and then there was a lot of conversation of, “Do we want to reveal this early, do we want to leave this a complete surprise for the fans?” There were different levels to the reveal of Jeffrey and him coming back. But it was always a hope. And it as always something that we knew by him coming back, we knew 300 would take on a whole different aura. Episode 300 feels like rarefied air. When the writers set out to craft this episode, what were the biggest goals? 300 has always been a milestone for us. 200 was a look back at the show and its greatest hits, I would say. Phil Sgriccia who directed that episode, Robbie Thompson who wrote it, did an amazing job articulating that in a really cool way. We didn’t want to do that again. This show has a lot of history. It has a lot of fun meta stuff we can and do go back to the well for. But ultimately, this is the emotional story of two guys. And we wanted to use 300 as a way to galvanize that story, resolve some things but not feel like an ending. And allow our guys to move on in a different way. Dad coming back felt like a really, really great way to do that. He represents something so significant for Sam and Dean. And also Mary. His life has touched them all. It was very important for us to talk about the history of the show, but in this case, the emotional history of the show. The emotional story these guys have been on for the past 14 years. What can you preview about how John returns to the series? Sam and Dean—as so often happens—come across an item that they think is going to solve their immediate problem of Michael in Dean’s head. It goes a way that is not planned. But once they figure out what happens, it makes a lot of sense. The problem with this thing that “gives you your heart’s desire,” is you sometimes don’t know what your heart wants. In this case, John’s return is very much a surprise, but as Dean says in the episode, deep down, he’s wanted [this whole family reunion] since he was five years old. It makes a ton of sense that this is what happens. 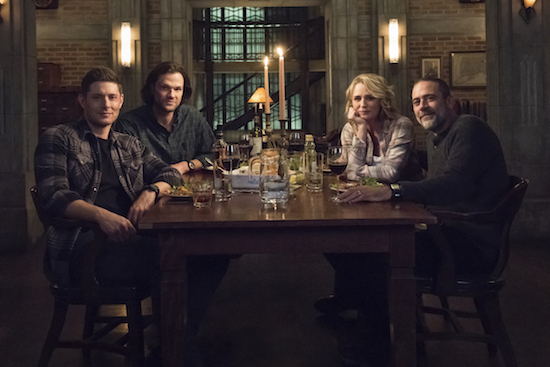 Sam and Dean had a number of moments with their father in the first couple of seasons—and time travel allowed other family moments in the past—but now that Mary (Samantha Smith) is back, this is the first time the family has truly been together in present day. What was most important to showcase in those scenes? [We asked] ourselves questions about Sam and Dean and also about ourselves. How you look at your parents when you’re 20 years old and how you look at your parents in your late 30s, early 40s, which is where Sam and Dean are, is very different. When Meredith, Bob Singer [who directed the episode], and I would have conversations, it was like, what change took place in that perception and what conversations you had with your parents as you got older? And then once you have the real, personal aspects to that, it’s how are you going to apply that to Sam and Dean and their very specific history. It was basically psychoanalysis. But it allowed us to give Sam and Dean similarly honest and mature conversations with their father; conversations they would not have had 12 years ago when he passed away. It takes a lot of work to make it to episode 300. What can you say about the team that helped carry the series to this point? We have been incredibly fortunate that since day 1 of SUPERNATURAL, our crew has remained incredibly consistent. I think we have 80, 85 percent of the people working on the show have been there since day 1 in some capacity. In television, especially right now, that’s unheard of. People leave. They go to other jobs. People have raised families on the show, had children. Those children are now driving. It really has become a family atmosphere. That comes from two factors. One is Bob Singer, who has been an EP on the show since the day it began. He did a really great job of creating a great atmosphere up in Vancouver that is inclusive and welcoming and is amazing. Number two is Jared and Jensen. They have totally bought into it, they tell the story. Eric Kripke sat them down and said, “This is your show. You set the tone for the show. It can be a good tone or a bad tone.” We all know TV shows where the stars are maybe a little bit unhappy and they make everybody else’s lives miserable. Jared and Jensen—I’m not going to say every day is amazing, because we all have our bad days—they have never allowed it to impact the crew, the cast, or anyone else. They have been exemplary leaders on this show. Because of that, everyone else has a good time. We’re able to bring people back. We’re able to have this very inclusive, familial community in Vancouver and also down here in L.A.